By Arend Lammertink. May-June, 2012. In the past months, David Wilcock posted an epic work on Financial Tyranny. One of the most interesting parts of that story is a lawsuit against the central banking system that has been filed by Neil Keenan and Keith Scott, a story that had been covered by Benjamin Fulford for quite some time already. When I investigated this story further, I found out that current International Civil law and thus all the nations operating under this jurisdiction (including the corporate US government) ultimately are legally nothing but vassals of the Vatican. In other words: (virtually) all nations are legally operated as (de-facto) corporations under the jurisdiction of the Vatican. And as we will see, that gives some very interesting possibilities that may offer some solutions to the problems we are facing. The story starts with the Keenan lawsuit, which uses a powerful commercial lien process under Common Law. One of the advisors in that process is Winston Shrout, who is considered to be an expert in this field. In an interview with Wilcock, Shrout referred to the Bible as his source for the legal processes he was using, but Shrout was not aware of any books people may read for more information. So, I went looking on the internet what I could find, and I found the book "Pied Pipers of Babylon" (pdf) by Verl K. Speer, which goes into the history and fundamental principles of Common Law, the law system used by the Anglo-Saxons in England. He claims that this system originates from the Israelites, which migrated to Northern Europe and that it is the same system one can find in the Bible. Another part of this story, is the process talked about by a fellow named Drake. He talks about returning the US to common law before Law Enforcement agencies in the US will perform mass arrests of the bankers in the US. In this process, juries are formed (an important feature of common law) in various states, which file some paperwork by which the states declare their independence of the corporate Washington government and return to their original constitution and bill of rights. Further investigations revealed that the authority the current Kingdom of The Netherlands, as well as the rest of Europe and (most of) the World, legally operates under up to this day is none less than the Vatican, which gives us some very interesting possibilities to liberate the people of this planet from literally ages of (financial) tyranny under jurisdiction, authority, sovereignty and responsibility of the Vatican. The essential trick for a nation to liberate itself, is to declare a bill of rights and a republican constitution by referendum under common law and under the authority of the people themselves, after the example that has been set in the late 1700s by all three mentioned republics. As far as I am aware, the US did not use a referendum, but the Dutch Batavian Republic definitely did. It may be possible to use some other process, but with a constitution ratified by the people of a nation by referendum there is no question about the legal validity nor authority of said constitution. In other words: NO ONE can legally prevent the people of a nation to declare their independence under common law. What this does is that it establishes a new legal entity, a free and really independent Republic, under the jurisdiction of Common Law instead of under the jurisdiction of international civil law, which up to this day still operates under authority and sovereignty of the Vatican. In other words: you now have two DIFFERENT legal entities governing over one and the same country, of which only one is really free and independent and operates under the authority of the People now actually OWNING their land instead of legally STILL being a vassal of the Vatican. The latter STILL being the case for at least all previous colonies of the United Kingdom, France, The Netherlands and Spain as well as ALL of Europe and Russia. The other side of this is that the legal entity that still exists as a vassal of the Vatican no longer has any subjects nor any possessions within the now liberated country, BUT it is still burdened with ALL of its obligations and liabilities established under the authority and responsibility of the Vatican. So, these are NOT the problem of the now liberated people, which were after all just subjects ruled under the sovereignty of the Vatican. In other words: we now have not only a nice trick to liberate a nation, but also a convenient way to get rid of the problem of nation's debt, which is now the problem of the Vatican and not of the nation's self-liberated people. What's even more interesting, is that this process could in principle also be done at a global level by the UN. If the general assembly would make a statement in which they declare the whole planet to be free and independent under Common Law by declaring a bill of rights and a global constitution after the example set by the US and the Dutch Batavian Republic, then all people would be free from suppression by the Dark Cabal. And the burden of ALL global debts established under the authority and responsibility of the Vatican would no longer be the problem of the people of this planet. Yes, we are aware of this. If the US removes the P2 fascist government run via the United States of America corporation, then all US external debts will not have to be paid by the American people. We are trying to bankrupt that war mongering and murdering corporation and their fascist overseers at the P2 Roman empire headquarters. This in no way implies we are opposed to the beliefs held by the majority of Catholics. This P2 lodge can indeed be linked to the Vatican as well as various (international) crimes, as you can read in this paragraph. Many of you have heard� many have not. Announced publicly on 25 December 2012, the system of Corporate-Governmental rule has been foreclosed. Legally foreclosed� via one of its own mechanisms. The �Powers That Be� are now the �Powers That Were�. All debt has been erased and corporations � including but not limited to Corporate Governments and Banks � have been foreclosed. Sure, they may continue to play along in hopes we will play along with them. But thanks to a series of UCC (Uniform Commercial Code) filings made by the One People�s Public Trust (known as OPPT) the choice is now yours to make. A new framework for social governance is now in effect; a fact that has been ratified by the �legal� framework of its corporate-controlled predecessor. Systemically speaking� WE ARE FREE!! As far as I understand the OPPT documents at this moment, it appears they not only lawfully declared the whole planet to be free, they also circumvented the authority claimed by the Vatican. The Vatican's authority is essentially based on claiming the Pope to be the intermediary between We, The People, and the Creator. Since the OPPT declaration directly draws it's authority from the Creator itself by means of a very clever lawful declaration in which each person is recognized as BEing an aspect of the Creator AND this part BEing indistuingishable from the whole, this declaration lawfully declares that We, The People have no one to answer to, but the Creator itself. The way I see it, the OPPT at it�s very core invalidated the authority of the Pope and thus, by extension, of the whole Roman type Civil law system. 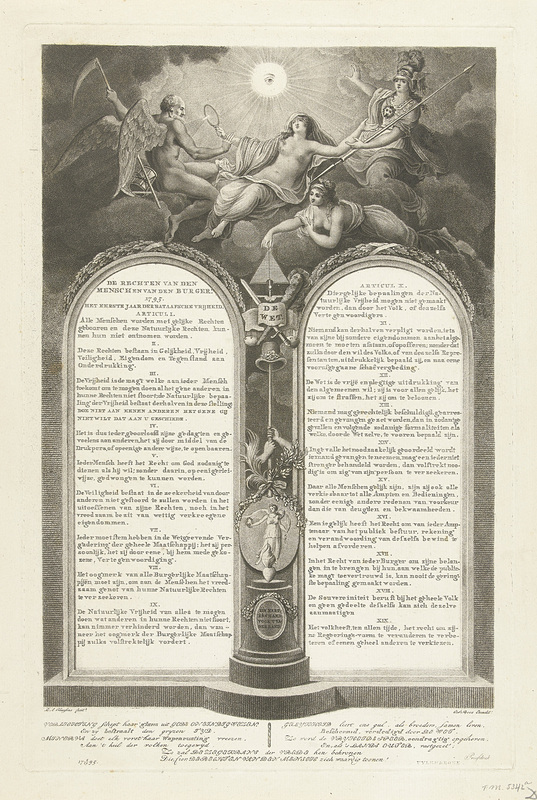 It claims that we as a people have no one to answer to but ourselves and the creator and are essentially bound to common law, which is exactly the jurisdiction under which not only the United States but also the (former) Dutch Batavian and French Republics have been founded, even though the latter two have been overthrown by the defeat of Napoleon. Interestingly, the legal entitity �Batavian Republic� still exists. It has essentially been occupied by a foreign entity, the Kingdom of The Netherlands, which derives it�s authority from the �holy and individed trinity� a.k.a. �the Vatican� and/or �The Pope�. So, IMHO the OPPT is essentially a global declaration of independence and a bill of rights. And since the declarations by the above mentioned republics were legally valid, I see no reason why this one would not be legally valid. Yes, these republics filed their declarations in a different way, basically by publishing it and/or noticing their previous ruler which would be some king, but that does not mean that the way the OPPT published their declaration is invalid. Now of course, no one asked for your permission when founding any of the above mentioned republics. However, none of these take away anything from you, especially regarding your rights. All they do is declare you to be free and answerable only to the creator. What you do with those rights is totally up to you. In other words: the whole thing is most of all an idea. And the idea is that all people are created equal and free. 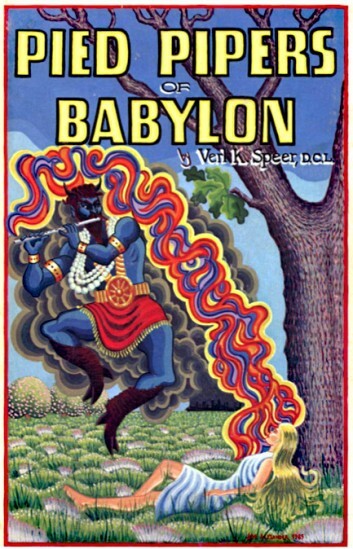 The Doctor of Common Law, Verl K. Speer released his book Pied Pipers of Babylon in 1985. Out of print with limited used copies in circulation, this book needs to be in the hands of all who care for their future, the world we live in, and the system we are subjects to/of. Much of what Winston Shrout teaches is based on Dr. Speers work. He was way ahead of his time in respects to understanding the truth about law and the mercantile system, Dr. Speer experienced the destruction first hand through the subsidies and controls inflicted upon his family farm in Kansas. The key discovery of Dr. Speer is that Americans have become subject to a foreign system of law - essentially a form of the Roman civil law. This jurisdiction, he says, was imposed on our country by England. He Contrasts this with the "other great system," the common law. "Common law," as Speer defines it, is based on reason and the immutable laws of God and nature. It is the law of conscience - and as such, it can not be written, only written about. One of the first things of interest this reviewer learned from "Pipers" was the cause of the American Revolution. It was not, as most people think, the tax on tea or "taxation without representation." Rather, as is mentioned in two separate places in the Declaration of Independence, it was England's attempt to subject Americans to the civil law. Today, says Speer, maritime law has come ashore and threatens to squeeze Out all our rights. How then have Americans been tricked out of their common-law rights and into the admiralty courts, just as happened more than 200 years ago? Speer explains this in his book. Furthermore, he examines the principles applicabl e to the resolution of this dilemma, and how they may be invoked and implemented. Among the topics covered in great detail by Speer are the "malady of paper money" and the powers of the jury to judge the facts and the law , and to nullifv the law where necessary-that is, whenever the law is unjust. Also covered at length is the subject of land patents and alodial land title . "Love your neighbor like yourself". Now the essential difference between common law and civil law is the *authority* under which the legal system operates. With common law AND trial by jury, the government is under control of the people, because a proper jury cannot only sentence according to the law, it can ALSO judge the law itself. VERY important detail. See Speer for all the details. This whole thing about "Admiralty Law" is a fraud. Admiralty law is also known as Maritime law and it was formed in the 13th Century by the the Venetian/Magyar trading families. The word "Maritime" is a 13th Century word formed from two Latin words maris meaning �sea and see as in Holy See� and timeo meaning �to fear, be afraid (of)�. Hence the literal original meaning of �maritime law� is to �be fearful and afraid of the Law of the Holy See (Vatican)�. If you want to learn more, read the Canons of Positive Law. In other words: we are looking at a war between the peoples authority and centralized authority, with the Vatican, the Holy See, at the ultimate control, hiding behind the scenes. The woman (a church) that rides the beast (a kingdom) in Biblical symbolism. Interestingly, this can be (legally) confirmed based on a/o the 1815 treaties of Paris and Vienna, as you can read in this section. Now in the symbolism of the pyramid with the capstone with all seeing eye floating above the pyramid, you have the symbol for the hidden force behind the scenes, the Vatican. All right. Now according to Veith, the Huguenots were the true followers of the word of God, the Bible. Translated into law terms this means: the Huguenots were the proponents of Common Law, while Napoleon, probably a Freemason who apparently actually worked for the Vatican and the Jesuits, was a proponent of Civil Law. In other words: accordingly, the Feemasons setup the French revolution as agents of the Vatican in order to hide and regroup, because the printing and widespread availability of the (Gutenberg) Bible blew their cover. The idea that the Freemasons were involved in the French Revolution is further substantiated by Albert Pike's book, as you can read in this paragraph. The Protestant reformation was born of the rediscovery of Christ's salvation and identifying the papacy as the Antichrist. Protestant historicists saw prophecy fulfilled down through the centuries and into the modern era. Rather than expecting a single Antichrist to rule the earth during a future Tribulation period, Martin Luther, John Calvin and other Protestant Reformers saw the Antichrist as a present feature in the world of their time, fulfilled in the papacy. They were unanimous in this interpretation lending emphasis to their reformation. It led them to protest against Rome and it became their rally and battle cry. Controversial features of the Reformationist Historicist interpretations is the identification of the Antichrist (1 and 2 John), the Beasts of Revelation 13, the Man of Sin or Man of Lawlessness in 2 Thessalonians 2, the "Little horn" of Daniel 7 and 8, and the Whore of Babylon (Revelation 17) with the Roman Catholic Church, the Papacy and Papal States, and each successive Pope himself. The traditional Roman fasces consisted of a bundle of birch rods, tied together with a red leather ribbon into a cylinder, and often including a bronze axe (or sometimes two) amongst the rods, with the blade(s) on the side, projecting from the bundle. They were carried by the lictors who accompanied the magistrates. The axe often represents the power over life or death through the death penalty, although after the laws of the twelve tables, no Roman magistrate could summarily execute a Roman citizen. It was used as a symbol of the Roman Republic in many circumstances, including being carried in processions, much the way a flag might be carried today. In what became known as the St. Bartholomew's Day Massacre of 24 August � 3 October 1572, Catholics killed thousands of Huguenots in Paris. Similar massacres took place in other towns in the weeks following. The main provincial towns and cities experiencing the Massacre were Aix, Bordeaux, Bourges, Lyon, Meaux, Orleans, Rouen, Toulouse, and Troyes." They relocated to Protestant nations, such as England, Denmark, Switzerland, the Dutch Republic, the Electorate of Brandenburg, Electoral Palatinate (both in the Holy Roman Empire), and the Duchy of Prussia, and also to the Dutch Cape Colony in present-day South Africa and the English 13 colonies of North America. [...] After the revocation of the Edict of Nantes, the Dutch Republic received the largest group of Huguenot refugees, an estimated total of 75,000 to 100,000 people. Amongst them were 200 clergy. Many came from the region of the C�vennes, for instance, the village of Fraissinet-de-Loz�re. This was a huge influx as the entire population of the Dutch Republic amounted to ca. 2 million at that time. Around 1700, it is estimated that nearly 25% of the Amsterdam population was Huguenot. There are a few remarkable differences in the wordings compared to the French one and also the symbolism is totally different. Even though at first glance the symbolism appears to be very similar, in reality the details are VERY, VERY different. There is no Jacobinian hat and thera are no fascii. Also, the declaration itself is significantly different in a few key points compared with the French Masonic/Cabal version. 1. All Humans are born with equal Righs and these Natural Rights cannot be taken away from them [i.e. are inalienable]. Note the difference. The French version basically says that the people are subjugated to the higher good, while the Dutch (Huguenot) version declares the natural rights (as given in the Bible of course) to be inalienable. 3. Liberty is the power deserved by every Human Being to be allowed to do everything which does not disturb others in their Rights; the Nutral determination of Liberty therefore exists in this rule: DO NOT UPON OTHERS THAT WHICH YOU DO NOT WANT TO HAPPEN UPON YOU. Note the differences. In the French versions, limits to freedom can be determined by (civil, Roman type) law. In other words: freedom can (and WILL) be limited by the government in the French version, where in de Dutch version it is defined along the Biblical concept of "love thy neighbor like thyself". 5. Every Human has the Right to serve God in such a way as he wants to; without it being possible to be forced therein, in any way. Once again, totally different. In the Dutch version, one is essentially bound to God's highest command, which is: "love thy neighbor like thyself", while the French version is once again conditional. It can be limited by law, the law determined by the government of course. 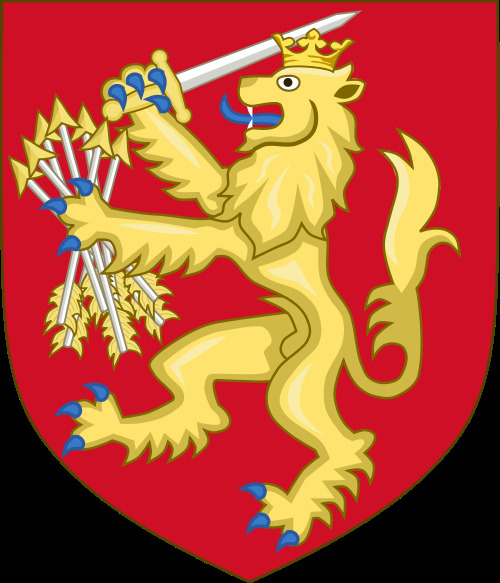 The Batavian Republic was founded in 1795 used in its first year the arms of the Republic of the Seven United Provinces, the Dutch lion or lion with crown generality, sheaf of arrows and swords. 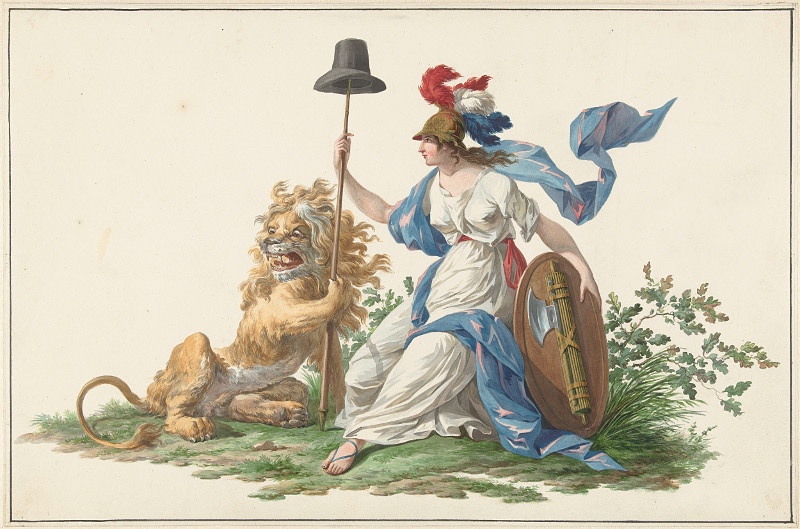 But on May 4, 1796 the Dutch Lion badge was replaced by a free drawing of the Netherlands Maiden around an altar with an anchor dismantled, but it was decided to keep States Lion with HER. In 1574 a new heraldic motive was chosen, which had to include the Dutch Lion, a widely recognized and respected heraldic motive in the Netherlands. This new Dutch Republic Lion should represent every region and not one in particular. The chosen design was a gold lion on a red field. 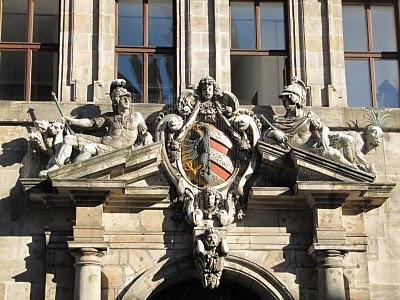 Its symbolism meant a blend of the coat of arms of the provinces of Brabant, Gelderland (from these two the golden lion was taken) and Holland (whose coat of arms was the opposite) and those of Burgundy and Nassau. The Dutch Republic Lion had also a sheaf of arrows and a sword bar, taken from the crest of Charles V in his seal as "Lord of the Netherlands" and the sheaf of arrows as a symbol of unity. Their sovereignty emphasized the "Mightiness lords" of the States General by a crown to place their arms. 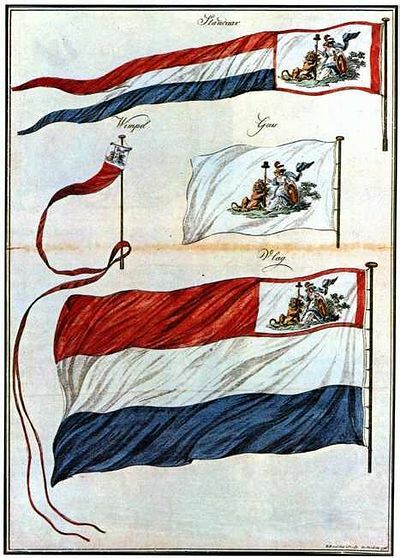 The arrows symbolize the seven provinces that made up the Republic, the sword the determination to defend their liberty, and the coronet their soveriegnty. An interesting detail is that declaration of human rights was established by the independent Provinces, particularly Holland who announced it officially, while the Arms and constitution were crafted later by a (central) parliament. The constitution was adopted after a coup on january 22nd 1798 by a group of radical Batavians under leadership of Pieter Vreede (1750-1837) and Wijbo Fijnje (1750-1809) with the support of French troups. So, it is clear that French influence increased rapidly. A Lodge inaugurated under the auspices of Rousseau, the fanatic of Geneva, became the centre of the revolutionary movement in France, and a Prince of the blood-royal went thither to swear the destruction of the successors of Philippe le Bel [King of France 1285-1314] on the tomb of Jacques de Molai. The registers of the Order of Templars attest that the Regent, the Duc d'Orleans, was Grand Master of that formidable Secret Society, and that his successors were the Duc de Maine, the Prince of Bourbon-Cond�, and the Duc de Coss�-Brissac. The Templars compromitted the King; they saved him from the rage of the People, to exasperate that rage and bring on the catastrophe prepared for centuries; it was a scaffold that the vengeance of the Templars demanded. The secret movers of the French Revolution had sworn to overturn the Throne and the Altar upon the Tomb of Jacques de Molai. When Louis XVI. was executed, half the work was done; and thenceforward the Army of the Temple was to direct all its efforts against the Pope. Jacques de Molai and his companions were perhaps martyrs, but their avengers dishonored their memory. Royalty was regenerated on the scaffold of Louis XVI., the Church triumphed in the captivity of Pius VI., carried a prisoner to Valence, and dying of fatigue and sorrow, but the successors of the Ancient Knights of the Temple perished, overwhelmed in their fatal victory. Note the peculiarities: "Royalty was regenerated" and "the Church triumphed in the captivity of Pius VI". Apparently, in the eyes of Albert Pike, Royalty was restored by overturning the power of the Pope, while this was a positive thing for "the Church". Civil and religious Freedom must go hand in hand; and Persecution matures them both. A people content with the thoughts made for them by the priests of a church will be content with Royalty by Divine Right,�the Church and the Throne mutually sustaining each other. They will smother schism and reap infidelity and indifference; and while the battle for freedom goes on around them, they will only sink the more apathetically into servitude and a deep trance, perhaps occasionally interrupted by furious fits of frenzy, followed by helpless exhaustion. Truths are the springs from which duties flow; and it is but a few hundred years since a new Truth began to be distinctly seen; that MAN IS SUPREME OVER INSTITUTIONS, AND NOT THEY OVER HIM. Man has natural empire over all institutions. They are for him, according to his development; not he for them. [...] Masonry early comprehended this Truth, and recognized its own enlarged duties. [...] It aided in bringing about the French Revolution, disappeared with the Girondists, was born again with the restoration of order, and sustained Napoleon, because, though Emperor, he acknowledged the right of the people to select its rulers, and was at the head of a nation refusing to receive back its old kings. He pleaded, with sabre, musket, and cannon, the great cause of the People against Royalty, the right of the French people even to make a Corsican General their Emperor, if it pleased them. Masonry felt that this Truth had the Omnipotence of God on its side; and that neither Pope nor Potentate could overcome it. So, is Masonry on our side, or on the side of the Pontiff? Is there a difference between Masonry and Freemasonry? Are there different factions within Masonry? And are there connections between Freemasonry and the Jesuits? German Masonry appeared a very serious concern, and to be implicated with other subjects with which I had never suspected it to have any connection. I saw it much connected with many occurrences and schisms in the Christian church; I saw that the Jesuits had several times interfered in it; and that most of the exceptionable innovations and dissentions had arisen about the time that the order of Loyola was suppressed; so that it should seem, that these intriguing brethren had attempted to maintain their influence by the help of Free Masonry. I have met with many particular facts, which convince me that this use had been made of the meetings of Masons, and that at this time the Jesuits interfered considerably, insinuating themselves into the Lodges, and contributing to encrease that religious mysticism that is to be observed in all the ceremonies of the order. This society is well known to have put on every shape, and to have made use of every mean that could promote the power and influence of the order. And we know that at this time they were by no means without hopes of re-establishing the dominion of the Church of Rome in England. Their services were not scrupled at by the distressed Royalists, even such as were Protestants, while they were highly prized by the Sovereign. We also know that Charles II. was made a Mason, and frequented the Lodges. The Lodges in France naturally became the rendezvous of the adherents to their banished King, and the means of carrying on a correspondence with their friends in England. At this time also the Jesuits took a more active hand in Free Masonry than ever. They insinuated themselves into the English Lodges, where they were caressed by the Catholics, who panted after the re-establishment of their faith, and tolerated by the Protestant royalists, who thought no concession too great a compensation for their services. At this time changes were made in some of the masonic symbols, particularly in the tracing of the Lodge, which bear evident marks of Jesuitical interference. The Knights Templars of Jerusalem, and the Knights of the Desert, whose office it was to protect pilgrims, and to defend the holy city, afforded very apt models for Masonic mimicry, because the Temple of Solomon, and the Holy Sepulchre, always shared the same fate. Many contended doctrines of the theologians had also their Chevaliers to defend them. In all this progressive mummery we see much of the hand of the Jesuits, and it would seem that it was encouraged by the church. These cheats found it convenient to make Masonry one of their conditions, and by a small degree of art, persuaded their pupils that they were the only true Masons. These Rosycrucian Lodges were soon established, and became numerous, because their mysteries were addressed, both to the curiosity, the sensuality, and the avarice of men. They became a very formidable band, adopting the constitution of the Jesuits, dividing the Fraternity into circles, each under the management of its own superior, known to the president, but unknown to the individuals of the Lodges. These superiors were connected with each other in a way known only to themselves, and the whole was under one General. At least this is the account which they wish to be believed. If it be just, nothing but the absurdity of the ostensible motives of their occupations could have prevented this combination from carrying on schemes big with hazard to the peace of the world. But the Rosycrucian Lodges have always been considered by other Free Masons as bad Societies, and as gross schismatics. This did not hinder, however, their alchemical and medical secrets from being frequently introduced into the Lodges of simple Free Masonry; and in like manner, exorcism, or ghost-raising, magic, and other gross superstitions, were often held out in their meetings as attainable mysteries, which would be immense acquisitions to the Fraternity, without any necessity of admitting along with them the religious deliriums of the Rosycrucians. These are intriguing questions that are not easy to answer, but the links just above may give you some clues. More books on the Jesuits here. Propaganda Due, or P2, was a Masonic lodge operating under the jurisdiction of the Grand Orient of Italy from 1945 to 1976 (when its charter was withdrawn), and a pseudo-Masonic, "black", or "covert" lodge operating illegally (in contravention of Article 18 of the Constitution of Italy banning secret associations) from 1976 to 1981. During the years that the lodge was headed by Licio Gelli, P2 was implicated in numerous Italian crimes and mysteries, including the collapse of the Vatican-affiliated Banco Ambrosiano, the murders of journalist Mino Pecorelli and banker Roberto Calvi, and corruption cases within the nationwide bribe scandal Tangentopoli. P2 came to light through the investigations into the collapse of Michele Sindona's financial empire. "God's Banker" Roberto Calvi's connections with the Worshipful Master Licio Gelli became a particular focus of press and police attention, and caused the lodge (then secret) to be discovered. A list of adherents was found by the police in Gelli's house in Arezzo in March 1981, containing over 900 names, among which were very important state officers, some important politicians (four ministers or former ministers, and 44 deputies), and a number of military officers, many of them enrolled in the Italian secret services. Notably, the then future Italian prime minister Silvio Berlusconi was on the list, although he had not yet entered elective politics at the time. Another famous member was Victor Emmanuel, Prince of Naples, the current head of the House of Savoy. A document was also found in the possession of Licio Gelli titled "Piano di Rinascita Democratica" (Democratic Rebirth Plan) which amounted to a declaration of the lodge's intent; essentially, Gelli's goal was to form a new political and economic elite to lead Italy towards a more authoritarian form of democracy, in an anti-communist perspective. Roberto Calvi (13 April 1920�17 June 1982) was an Italian banker dubbed "God's Banker" by the press because of his close association with the Holy See. When the Italian Banco Ambrosiano went bust in the early 1980s, and the bank's president, Roberto Calvi, was discovered hanging from Blackfriars Bridge in London, the apparent victim of a Freemasonic ritualistic murder, an international scandal erupted, exposing the role of the illegal Italian Freemasonic Lodge, P-2, in a wide range of criminal activities, including a rash of right-wing bombings and assassinations all across Europe, during the late 1970s and early 1980s. When the membership list of the P-2 Lodge was leaked to the press, many of Europe's most prominent politicians, military officers, and intelligence chiefs were driven from office. In Italy alone, 47 Army generals and six Navy admirals resigned, following the May 20, 1981 public expos� of the lodge. Not coincidentally, the public exposure of P-2 came jsut seven days after the unsuccessful assassination attempt against Pope John Paul II, by Mehmet Ali Agca. Many in the Vatican, and in the Italian security services, felt that the P-2 Lodge had played some kind of role in the attempt on the pontiff's life. The chief of SISMI, Italian military counterintelligence, for whom Pazienza worked, was also identified as a lodge member. P-2 Grand Master Licio Gelli, a wartime Nazi collaborator, later suspected of ties to Soviet bloc intelligence, could also boast of strong ties to several people in the Reagan-Bush administration in Washington. One of the most prominent of the Reagan-Bush administration national security figures publicly tied to Gelli and his P-2 Lodge, was Michael Ledeen, a consultant to the National Security Council, and a close associate of President Reagan's first secretary of state, Alexander Haig (a former secretary general of NATO). Ledeen, although officially listed merely as a White House "consultant," was the liaison to Manucher Gorbanifar, the Israeli Mossad-linked Iranian "businessman" who brokered the original arms-for-hostage deals, through which the United States and Israel funnelled tons of weapons to the Ayatollah's regime, throughout the Iran-Iraq War. At his 1987 trial in Bologna, Italy, Francesco Pazienza confirmed Ledeen's links to the P-2, and to the "Super SISMI" apparatus, run by SISMI chief and P-2 member Gen. Giuseppe Santovito. Ledeen had inserted himself into the Reagan administration, courtesy of his P-2 friends. In October 1980, on the eve of the U.S. Presidential elections, Ledeen and Arnaud de Borchgrave had co-authored a series of front-page stories in the Washington Times, a newspaper owned by South Korean Rev. Sun Myung-Moon and his Unification Church. The stories revealed that Billy Carter, the brother of President Jimmy Carter, had been involved in secret business deals with Italian "businessman" Michele Papa (later exposed as a P-2 member), and Libyan dictator Muammar Qadaffi. The scandal had little impact on election day, because Ronald Reagan was to defeat Carter easily. It did, however, boost the credibility of Ledeen and Haig, his close associate, helping to land both men important posts in the newly elected Reagan-Bush administration. Italian investigative magistrate Palermo, during his own investigations of P-2, found that, in addition to Billy Carter, Michele Papa's Libya dealings had involved another P-2-linked financier, Giovanni Mario Ricci, of the Seychelles. The Ricci links to Qadaffi were further explored by Africa Confidential in the April 1987 issue that highlighted the Ricci-Pazienza-Williamson-Marc-Rich embargo-busting collusion. "The Seychelles International Bank continues to fascinate, by reason of its association with various exotic financiers, including some involved in such interesting escapades as the collapse of the Italian Banco Ambrosiano, the Italian bank which went under in 1982, leaving a huge hole in its accounts," Stephen Ellis wrote. Note: Another most interesting and shocking report (pdf) by EIR deals about how the African continent is allegedly being "managed" under the guise of "environmental protection" in the name of the WWF. Note that the Freemasons are in this case rumored to be linked to the death of a Pope, which is not the first time Freemasons have been involved with "special treatment" of a Pope. According to Albert Pike, Pope Pius VI also made himself not too popular with the Freemasons and was treated accordingly. So, while one can find many links to the Vatican as an institution being involved in various crimes, this does not mean one can draw conclusions on particular members of neither the Roman Catholic Church nor the Freemasons. It appears that within these organizations different opposing factions exist, which makes researching this subject pretty confusing. And the ordinary "uninitiated" followers/members of these organizations have absolutely no idea about the crimes that are being perpetrated in the name of these organizations. In other words: we here have a treaty that says that the "Royal Authority" has been "happily re-established" in France in 1815, in the Name of the "Most Holy and Undivided Trinity". Medieval Sourcebook: John I: Concession Of England To The Pope. do offer and freely concede to God and His holy apostles Peter and Paul and to our mother the holy Roman church, and to our lord pope Innocent and to his Catholic successors, the whole kingdom of England and the whole kingdom Ireland, with all their rights and appurtenances,[...]; and now receiving and holding them, as it were a vassal, from God and the Roman church, [...] we perform and swear fealty for them to him our aforesaid lord pope Innocent, and his catbolic successors and the Roman church, according to the form appended; and in the presence of the lord pope, if we shall be able to come before him, we shall do liege homage to him; binding our successors aid our heirs by our wife forever, in -similar manner to perform fealty and show homage to him who shall be chief pontiff at that time, and to the Roman church without demur. So, ALL Kings of England, as of 1213, operate under the authority of the "chief pontiff", which is of course the head of the Roman church. So, legally the "chief pontiff" can also be identified under the name "Most Holy and Undivided Trinity", since that is the name under whose authority the 1815 treaties of Vienna and Paris were signed. To the most high and mightie Prince, James by the grace of God King of Great Britaine, France and Ireland, Defender of the Faith, &c.
1 In the beginning God created the Heauen, and the Earth. 26 And God said, Let vs make man in our Image, after our likenesse: and let them haue dominion ouer the fish of the sea, and ouer the foule of the aire, and ouer the cattell, and ouer all the earth, and ouer euery creeping thing that creepeth vpon the earth. In other words, here we have a document, authorized (indirectly) by the legal entity identified by a number of names, amongst which "chief pontiff" and "Most Holy and Undivided Trinity", wherein it is testified that some entity, legally identified by the name "God", made (authored) the Earth and gave it to the people (article 26). In other words: legally, we are looking at an authorized document, written well before the birth of Jesus Christ, in which the ownership of the Earth is claimed and given to the people. So, if this legal entity, identified by a/o the NAME "Most Holy and Undivided Trinity", can legally claim ownership of the Earth, it can only do so if it can come up with a document that proves that the people, who were given dominion over the Earth according to article 26, handed the ownership of the Earth over to this legal entity. If it cannot, then of course all people and all nations have the right to declare their independence and to claim ownership of the lands they are living in under Common Law, the laws of the people, the laws of conscience, the law of loving thy neighbor. For this reason the Roman Church maintains that the Western kingdom have been given over to her possession by Constantine, and demands tribute from them to this day, with the exception of the two kingdoms of the Franks (i.e. he French and German). 3. by making the spiritual and political dominion of the Church supreme in the lands thus �let� to friendly nations. The most famous example of such a bargain in transfer is undoubtedly Ireland. Ireland had been for some time the prey of internecine wars which were steadily but surely bringing it to total state of quandary. By 1170, in fact, she had already had sixty-one kings. It so happened that the popes, having decided to bring the Irish, among whom were �many pagan, ungodly and rebellious rulers,� under the stern hand of Mother Church, planned a grand strategy thanks to which they would not only impose the discipline of their religious system, but also tie to the papacy more firmly than ever the English kingdom by conferring upon the English monarch the sole right to conquer that island and subjugate its people. This is perhaps the most famous forgery in history. For centuries, until Lorenzo Valla proved it was forgery during the Renaissance it provied the basis for papal territorial and jurisdictional claims in Italy. Probably at least a first draft of it was made shortly after the middle of the eighth century in order to assist Pope Stephen II in his negotiations with the Frankish Mayor of the Palace, Pepin the Short. The Pope crossed the Alps to anoint the latter as king in 754, thereby enabling, the Carolingian family, to which Pepin belonged, to supplant the old Merovingian royal line which had become decadent and powerless and to become in law as well as in fact rulers of the Franks. In return, Pepin seems to have promised to give to the Pope those lands in Italy which the Lombards had taken from Byzantium. The promise was fulfilled in 756. Constantine's alleged gift made it possible to interpret Pepin's grant not as a benefaction but as a restoration. In this article, we found some fascinating links between Biblical prophecy and real, hard evidence about the nature of the Vatican as an institute, linking it not only to the legal framework the nations of the world currently operate under, but also to secret societies like the Jesuits and the Freemasons. While it is unclear what the influence of these secret societies is, it is clear that the Vatican up to this day claims to own the whole world and that (most) nations up to this day operate under it's jurisdiction as vassal states, including the United States of America with their corporate Washington government. However, the history of the United States and the two republics that were founded in the same era, the French and Dutch Batavian Republics, reveal that there is a way nations can liberate themselves from the legal system operating under the jurisdiction and sovereignty of the Vatican, which comes down to declaring their independence under common law, the law system that operates directly under the authority and sovereignty of free people. That way, a new legal entity is created, which does not only liberate the people of a nation, but also gets rid of the debt of such a nation, because that debt consists of liabilities by ANOTHER legal entity, ANOTHER legal entity operating under the responsibility of the Vatican. We also have very good reasons to believe Auschwitz was an uranium enrichtment facility which produced a critical part of the enriched Uranium used in the atomic bombing of Hiroshima and Nagasaki, which would thus not have been possible without said production facility. We know who profited from this, from the Bush family in the US all the way up to the "highest circles" in The Netherlands (have been interviewed (mp3) by former US Nazi prosecutor John Loftus on this matter). And we know how the Muslim Brotherhood, the Nazis and Al-Qaeda fit into the picture. And once again, there appear to be connections to the Vatican both in Vietnam as well as in WW-II. And of course, it is well known that the Vatican operated the so called ratlines after WW-II. You see, the problem is not that we, the people of this planet are not capable of producing enough food and stuff for every human being on this planet to live a life of luxury. We have the technology, we have the knowledge, we know our current science is a mess. But we can do better, we have the manpower to do it. We can turn the deserts green by letting the military and the oil companies use their skills for the people. Our car companies and engineers can convert our cars to run on water by tapping the power from the aether, we can do all that. If only we put our minds to it. So, logically speaking, there should be no problem deciding who gets what, because there could be more than enough for everyone. The problem is that just a handful of people are too greedy to let that happen. And those are not the �communists�, �socialists�, �republicans�, �democrats� or whatever on the streets. And as long as we do net get our acts together and recognize where the problem lies, we are never going to solve it. So, maybe it�s time to try something else. 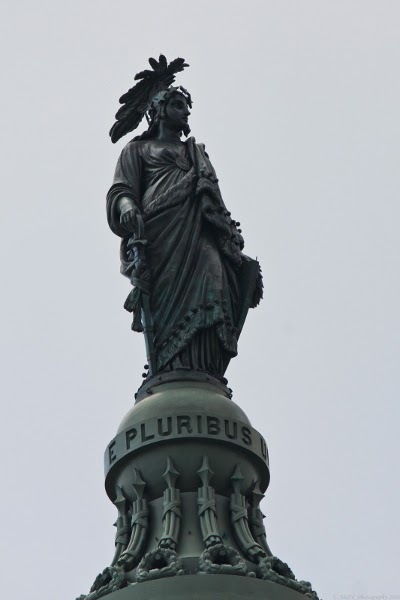 My idea: a Republic after the example of the United States, which did work until the "corporation" took it over and created the corporate Washington government and the FED banking cartel. A cooperative (�coop�), co-operative (�co-op�), or co�perative (�co�p�) is an autonomous association of persons who voluntarily cooperate for their mutual social, economic, and cultural benefit. Cooperatives include non-profit community organizations and businesses that are owned and managed by the people who use its services (a consumer cooperative) and/or by the people who work there (a worker cooperative). Raiffeisen stated that there is a connection between poverty and dependency. In order to fight poverty one should fight dependency first. Based on this idea he came up with the three �S� formula: self-help, self-governance and self-responsibility. Originally in German: Selbsthilfe, Selbstverwaltung and Selbstverantwortung. When put into practice the necessary independence from charity, politics and loansharks could be established. Let�s start with an old dream mentioned by Alexander Hamilton in 1788: �It has been observed by an honorable gentleman that a pure democracy, if it were practicable, would be the most perfect government.� With this notion he unfavorably compared pure (or direct) democracy to the republic proposed by the Constitutional Convention in Philadelphia. This republic was to be what we call today a representative democracy. A representative democracy is founded on the principle of elected individuals representing the people. Usually you elect a representative (individual or party) for a fixed term � if you change your mind during the term � you can�t do much about it. Also representatives usually stand for a whole package of political objectives. If you don�t find your own mix � you need to accept compromises. On the other hand a pure (or direct) democracy may be less efficient, is believed to be impracticable on a large scale, and warnings of a mob rule go back as far as Plato. This being said many people, honorable or otherwise, hold up the dream of a pure democracy. New technology such as the Internet could place it within reach. Of course this is only the technical aspect. The remaining question is: will everybody be able to deal with every question or will people stop participating? Or will there be superficial decisions? � �sounds good � let�s vote for it�. This is where Liquid Democracy comes in. The basic idea: a voter can delegate his vote to a trustee (technically a transitive proxy). The vote can be further delegated to the proxy�s proxy thus building a network of trust. All delegations can be done, altered and revoked by topic. I myself vote in environmental questions, Anne represents me in foreign affairs, Mike represents me in all other areas but I can change my mind at any time. Anyone can select his own way ranging from pure democracy on the one hand to representative democracy on the other. Basically one participates in what one is interested in but for all other areas gives their vote to somebody acting in their interest. Obviously one may make a bad choice once in a while but they can change their mind at any time. With a Republic under common law, whereby all laws are to be approved by the People using liquid democracy, the People can control the power of the State and the Government. With (liquid) democratic controlled cooperatives, the People can control the money and debt system, using self-help, self-governance and self-responsibility. I. All Humans are born with equal Righs and these Natural Rights cannot be taken away from them [i.e. are inalienable]. II. These rights exist in Equality, Freedom, Security, Property and Resistance to Oppression. VIII. The objective of all Civil Societies must be, to insure the People the peaceful enjoyment of their Natural Rights. IX. The Natural Freedom of being allowed to do anything which does not disturb others in their Rights, can never be prevented, except when absolutely required for the objective of the Civil Society. X. Such provisions of the Natural Freedom are not allowed to be made, but by the People, or their Representatives. In other words: under the 1795 Dutch bill of rights, the People would (probably) be allowed to give the State a mandate to make a traffic law, when they think this is absolutely required for their security. And if you have trial by jury, whereby a jury has to decide unanimously, the jury can decide not to convict someone for breaking the law, either because they think the law is unreasonable or works out unreasonably in a particular case. There is a very interesting British document (pdf) (source) about a notification process under Common Law using the Magna Carta. Now if the people have been granted certain rights under the Magna Carta, and it is the Vatican under which authority and sovereignty this right was given by to a nation, then common law demands that all be treated equal in equal matters. And therefore, the whole planet has the right, either in part or as a whole, to publicly file the same kind of notice for all mankind at once. The concession Of England To The Pope was in 1213, the Magna Carta is from 1215, and therefore the Magna Carta applies to all nations currently operating under international civil law since it has been established under the jurisdiction of the Vatican. And that means this document can be extrapolated from and turned into a document whereby the people of the planet Serve Notice, under Common Law, to all politicians and all officials of all countries on the planet, that failure to take action to restore the people�s Sovereignty, and to overturn the treason and criminality that has occurred and is occurring at the highest levels on this planet, will lead to charges of being personally complicit in this treason and criminality and therefore liable to prosecution under Common Law. A joint media release by The Association of Citizen Prosecutors (ACP) and The International Tribunal into Crimes of Church and State (ITCCS) is to be released on "Canada Day", July 1, 2012. I don't know anything further about this lawsuit nor the people involved in this, but it may be significant. So, use your own judgment. I will watch this video later. Just found out that Anonymous posted an interesting video in 2011 already, which has been reported at 2012: What's the 'real' truth? blog and at ZeroHedge. I received a colorful email from Paul Andrew Mitchell who calls himself Private Attorney General, also posted at soundofheart.org. Since he posted it online and cc-ed his payed subscription mailing list, he apparantly has no objections to this being published. So, here it is. Due to an error, I accidently deleted this article and subsequently restored an earlier backup. I decided not to restore all updates. If you are interested, these can still be read at the scribd version. In this interview, Karen Hudes covers quite a lot of material covered in this article. Coincidence was to strike again as was becoming the norm throughout my adventure, although it never ceased to amaze me when it happened. This time it was the publication of a book co-authored by Robert Bauval and Graham Hancock called Keeper of Genesis. In their book they confirmed one of my theories; that in ancient Egypt the Pharaohs had to ritualistically cross the Nile at least once during their reign, imitating the Sun as it traverses the sky and crossing the Milky Way, the �starry waterway�, into their �pagan paradise�, the Duat. William mirrored this ritual as he crossed the Boyne into the �pagan paradise of the Irish�, Eamhain. Nearby was Dowth, whose original Irish form is Dubhadh, pronounced the same as the ancient Egyptian word, Duat, meaning darkness, dark place or underworld! Another surprising discovery was the similarity in the flowing contours of the Milky Way, the Boyne and Nile Rivers. This surely was beyond coincidence? There is one message, however, which I don't want to withold from you, especially now with the outright stealing of ordinary savers' money by the bankers in Cyprus and the news that Italy is next, which makes it clear that no bank account (in Europe) is safe anymore. In other words, if you intend to keep your savings, you may want to consider exchanging your worthless paper fiat currency at the bank into real money, like gold and especially silver. As I said yesterday, no one is going to stop me from doing what I do because I know, in the long term, that I am correct. Global central banks are going to print and print in their efforts to manage their way out of this debt crisis. They will fail and, with them, fiat currency will fail, too. In the end, a new international trade settlement system will emerge with a gold-backed unit of exchange at its heart. The only protection that I have against this wealth destruction is my stash of physical metal, which currently resides in a heavily-guarded vault at the bottom of the Marianas Trench. So what do you do today? You buy the freaking dip, that's what you do. If The Bullion Bank Cartel is going to insist upon giving us all more time to accumulate metal at deeply-discounted prices, I strongly urge you to take them up on it. Lord knows the Chinese, the Russians, the Indians and the Turks are doing so. You should be doing the same. 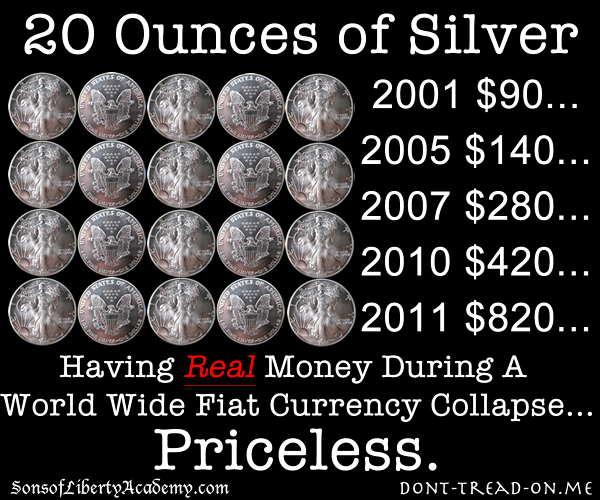 Namely, convert your rapidly-devaluing dollar reserves into hard assets, primarily gold and silver. Forget the goons in the media and the water-carrying shills for The Cartel, gold and silver are NOT in bubbles. That is complete nonsense! Since when does an asset that is currently owned by just 1% of global investors considered a "bubble"? Since The Cartel shills in the media declared it so, that's when. Ridiculous. Buying physical silver is by far the greatest act of wisdom and rebellion any American can and should be doing right now. It is both a Silver Bullet to rebel against the Elite�s corrupt system and a Silver Shield to protect your family and wealth in a post-dollar world. Buying physical silver is non-violent, non-compliant resistance. Most importantly, it works outside of the system and it cannot be stopped. 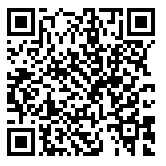 In case you live in The Netherlands and you want to buy physical silver coins, you may want to check out this website. Does the ESM Treaty violate the 1960s Vienna Treaty? Comments can be made here. And there is a thread for discussion at my favorite forum. Contact info, etc. 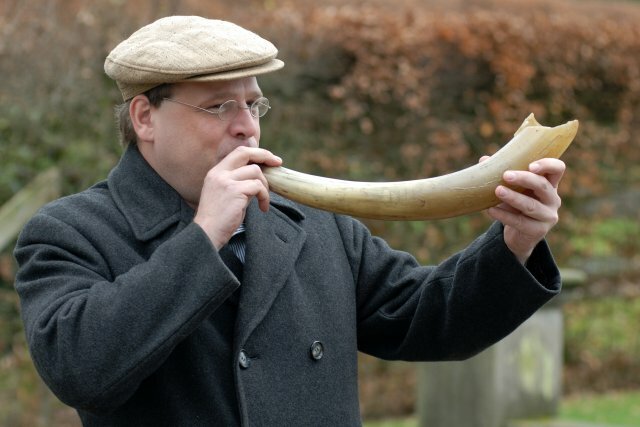 here, where I also explain why a Batavian horn blower has some score to settle with the Vatican. And you can follow me on Twitter or go to my facebook page.